Derby County have signed Aston Villa midfielder Barry Bannan on a month-long loan deal. 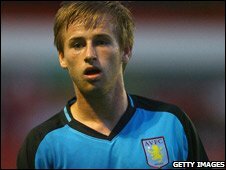 Bannan, 19, has not had many first-team opportunities for Villa but did play in their 2-0 Uefa Cup defeat away to CSKA Moscow on 26 February. The Scot signed professional terms for Villa in August 2008. He will provide cover for midfielders Miles Addison and Paul Green who have both been ruled out until the end of the season with foot injuries. Rams boss Nigel Clough told BBC Radio Derby: "He hasn't had too many first-team opportunities but he did play in the European game in Moscow. "He should be coming in for a month initially and then we'll look at it from there. He will cover us and help out all the way across the midfield four."